While Chinese venture capitals feel winter chill, the Southeast Asian startup scene rather looks optimistic. Silicon Valley venture capitals who once targeted China or India are now increasingly setting their eyes on Southeast Asia. 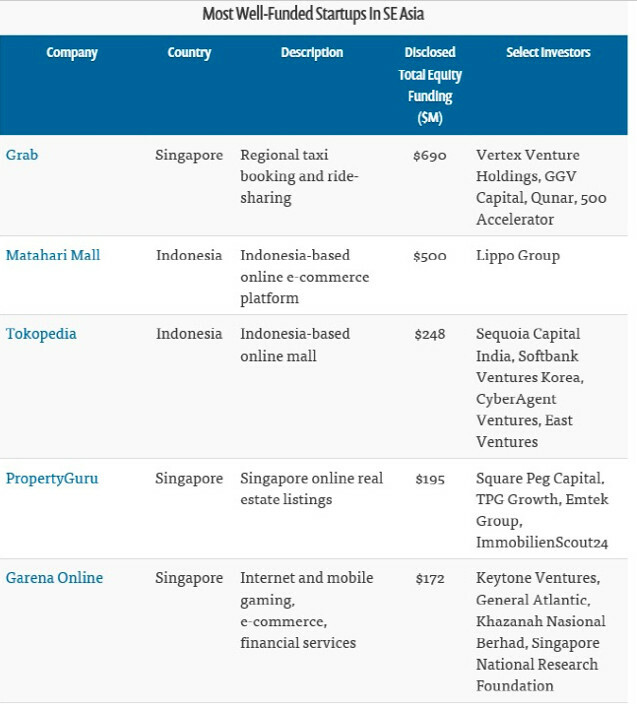 500 Startups, praised as one of the leading Silicon valley VCs investing in the region, is now boasting its own unicorns such as Singapore-based ride hailing app Grab as fruits from local investments into more than a hundred startups with its 25 million-dollar fund, named Durian Fund, raised in June, 2014. Mainland-based VCs are also poised to target assets in this fast-growing region and are making aggressive expansion. Gobi Partners which was born in 2002 in China and entered SE Asian market in as early as 2010 recently launched a $14.5 million fund dedicated to early-stage SE Asia startups, partnered with Malaysia Venture Capital Management Berhard (MAVCAP), the country’s largest venture capital firm. This was after Gobi Partners successfully finished their $50 million USD fund for Series A investments. Why are Chinese VCs investing in SE Asia? “Most of firms in Asia are still heavily focused on China and India, so Southeast Asia is a gem for early-stage investors as it has yet to reach the hype levels of China and India’s startup markets,” Kay Mok Ku, the Singapore-based partner at Gobi Partners said, during the talk at TechCrunch Beijing 2016. According to Ku, there are three main incentives for Chinese VCs to invest in SE Asia. First is for diversification of investment portfolio that otherwise would be too focused solely on Chinese market whose saturation is expected to come sooner or later. So, by investing in startups in SE Asia region, the portfolio gets much more diversified which effectively lowers the risk and creates room for potential synergy between SE Asia and Chinese startups. Another incentive is the market conditions in SE Asia. Southeast Asia’s internet economy could worth as much as massive $200 billion annually within ten years according to a new report released today by Singaporean sovereign wealth fund Temasek and Google and furthermore, region’s population is not only big but also relatively young which brings huge potential for entrepreneurship. The last but not least, SE Asia has less competition, compared to Chinese market where intense competition is evident. On top of that, for Chinese-born VCs, SE Asia is a region that feels closer to home. Indeed, current status of Southeast Asian market recalls what Chinese market was like ten years ago. And this means its development may also follow the footsteps of China. “A lot of services and Apps released in SE Asia often resemble the successful ones in China. In SE Asia, with less innovation and less risk, it is possible to yield successful cases in SE Asia,” said Adrian Li, the managing partner at Convergence Ventures. As a matter of fact, at this very moment, population of about 600 million people, many of whom are under the age of 40 are entering the internet economy via low-cost Chinese smartphones. “With young generation becoming much familiar with many of new trends, using China-born, silicon-valley-born Apps, the technology gap between China and SE Asia is disappearing,” Ku emphasized. Although SE Asia investment scene is looking rosy, practical challenges faced by the ones already jumped into the region do exist. The two main challenges are as follows. Southeast Asia consists of many different countries, each using different language and embodying different culture. Because of this, it is hard for a particular startup to penetrate their platform markets of neighboring countries. For instance, as reported by the survey by consulting firm Bain & Co. released in April, the region’s e-commerce platforms, while being well-funded, have been struggling to grapple with disparate languages, regulations and consumer preferences that varied largely from country to country. Jeffrey Paine, the founding partner at Golden Gate Ventures, confessed that SE Asia is, unlike India or China, very hard to expand although its size is about a quarter of China. This challenge places a greater importance on localization ability of the service and requires a more strategic movement when expanding cross border, for example, acquiring a local firm just as Tencent bought Sanook.com, the Thailand portal and Alibaba bought Lazada, the Singapore-based e-commerce firm. While SE Asia market is evidently vibrant, size of the investment deals closed in SE Asia actually are relatively smaller than what we often see in China market. “It’s still quite hard to raise a Series B, C or D round, and the size of the average round is not as big as people expect. In China, there are cases where tens of millions of dollars is raised for a seed round. But, this kind of huge deal is not very rare or even none in Southeast Asia.” Ku commented. Therefore, when considering the SE Asia investments, size of the deals should be distinguished from those in China. “In Indonesia, Series A are between US$1.5 million to US$3 million,” Adrian Li added. However, Chinese investors and Chinese IT giants do not seem deterred by such challenges. According to a survey by law firm Herbert Smith Freehills, acquisitive Chinese corporations are eager to follow Alibaba’s lead in making presence in the region. More than 45 percent of Chinese sizable corporations surveyed identified their top priority to pour their money into over the next three years as SE Asia. The strategies of SE Asia investment vary from company to company. Some are entering in a form of investment/acquitision just as Alibaba acquired Singaporian e-commerce platform, Lazada, while some are more aggressive in launching their products in this market by setting up local teams. “Baidu has set up a local team and released a completely local product specifically for Indonesian market,” Adrian Li said. JD is another Chinese company that is pushing relatively agressively into this region and already set up the local team for ‘localization’ of their service. The fact that the number of Mainland VCs being bullish on SE Asia is increasing with speed and more and more Chinese companies are devising strategies to pierce into SE Asia proves the potential of Southeast Asian market to be real. “There will soon appear a Southeast Asia-born unicorn and sooner or later an IPO in US exchange,” Jeffrey Paine answered in an assertive tone to the question of how he sees the SE Asia market in three years. However, due to challenges, both expected and unexpected from this yet immature market, it is hard to forecast where the next unicorn will be bred out from.